December 12, 2011 - Mokulele Flight Service, Inc. announces the full restoration of scheduled flight operations as of December 12, 2011. Mokulele voluntarily suspended operations temporarily to permit the Company to complete an internal records audit. Having fully resolved the records review, the Company immediately resumed operations. “We deeply regret the inconvenience that this service disruption caused to our valued customers,” said Ron Hansen, Chief Executive of Mokulele Airlines. “Our staff worked tirelessly to return our fleet to full operations as quickly as possible and we received the support and expertise of our code share partner Mesa Airlines operating as go!,” continued Hansen. Mokulele Airlines, is a commuter airline headquartered in Honolulu, Hawaii. The airline operates scheduled inter-island and charter flights primarily among Hawaii's smaller airports. The airline was founded in 1998 as Mokulele Flight Service by Rebecca "Kawehi" Inaba, and was the first airline in Hawaii to be founded by a Native Hawaiian woman. In 2005 it was acquired by Boyer Industries LLC, headed by former baggage handler turned entrepreneur William "Bill" Boyer Jr., who became the airline's CEO. After running into financial difficulties, the airline announced in March 2009 that Republic had taken a 50% stake in the company. Boyer relinquished the CEO position to Republic vice president Scott Durgin, moving to head the airline's sales and marketing efforts. Republic also assumed control of the Cessna Grand Caravan aircraft operated by Mokulele. A few days later, Mesa announced that the change of CEO allows the airline to terminate its agreement with Mokulele early, and would terminate the agreement effective March 24, 2009 and nullifying Mokulele agreement to operate Caravans as "go! express." 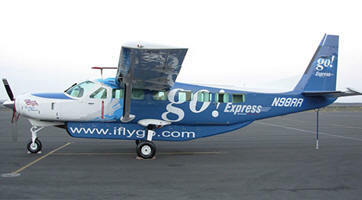 In November 2011, Mesa Air Group announced that it had sold the go! Mokulele turboprop operation, operated by Mokulele Airlines, to Scottsdale, Arizona-based Transpac Aviation Inc. go!Mokulele's turboprop services would continue to be operated by Mokulele under a code share agreement. On December 9, Mokulele grounded its fleet, four Cessna Grand Caravans while its new owner awaited the arrival of replacement parts following an internal record keeping audit. Mokulele Flight Services Inc., CEO Ron Hansen had said the voluntary shutdown was to give the company additional time to thoroughly research parts records and take any necessary corrective action. Hansen reported the parts involved were bolts, nuts and bushings. Hansen further stated that 46 flights had been canceled with an undetermined number of cancellations planned for the weekend. About 300 passengers fly daily on the routes that go from Honolulu to both Molokai and Lanai, as well as between Kona, Maui and Molokai. Hansen stated a record keeping error was discovered during a routine audit and is not a safety of flight issue.